As many people reading this know, I've been giving presentations to orchid societies for about twenty-five years in the U.S. alone and for longer than that in Brazil. In the last fifteen or so years I've also done the Canadian lecture circuit three times, two of them coast to coast and almost a month long. This adds to hundreds of presentations in total, and a few years back they were changed from slide to computer presentations; presentations have been exclusively digital in the last five years. Digital presentations are much more flexible in terms of content and, very importantly, allow us to see up to several subjects at once; this is very good for species or habitat comparisons, for example. All these presentations have things in common, and among these they showing lots of plants in their natural habitats. As a consequence we can discuss cultivation guidelines and at the same time travel through some beautiful countryside. The pictures shown in them are a result of more than thirty years of visiting the Brazilian orchid natural habitats, and unfortunately several of these places have been totally destroyed throughout the years so only the pictures remain. So following is a list of current presentations with a brief description and a sample picture to give an idea of the type of content. With time, new themes will be added. I still keep my Brazilian Cattleya and Laelia presentations, but they are rewritten for digital format and constantly improved with the addition of new photos. As digital flexibility allowed me to change the perspective and subject focus, the presently new Cattleya presentation is very different from the old one, so I ended up with actually two very different Cattleya ones instead of just one. The first of three in the Brazilian habitat series, this is the digital version of my long-time favorite Amazon presentation. It used to be a stand alone subject but now it fits much better as the first part of the series. As I lived in the Amazon for about four years, I had a chance to visit most of the more typical habitats in the region, and the result is that we can discuss the different main ecosystems, their particularities, and orchid species typical of each of them. This presentation is not limited to a particular group of orchids, and in fact the idea is to show the more different types of orchids as possible, thus giving a general idea of what we can expect to see in the region. This is the third part of the habitats series, and a logical following of the first two. Here, we travel throughout the coastal types of environments, from the beach and sand dunes to swampy areas and up into the coastal mountains. There are several main ecosystems shown and a lot of very interesting and showy orchids. Another light presentation, with impressive shots like this from the habitat of Laelia purpurata in South Brazil. Rio de Janeiro is one of the coastal states in the Southeastern region of Brazil. As such, habitats range from coastal to mountainous. This presentation starts at the beach, where we see which typical orchids can be found, and goes to the interior of the state. Doing so, we see the coastal rock boulders and swamps. lowland forests and climb the Serra do Mar and Mantiqueira at which tops our exploration ends. With this, we can have a good idea of which types of orchids grow in each particular habitat and interestingly many closely related orchids are found in one habitat but not in another one nearby. As most of the Brazilian orchids occur in coastal habitats, here we will see a lot of different genera and species. Brassavola tuberculata at the Sugar Loaf, Rio de Janeiro city. There is a multitude of rocky habitats in Brazil, and on most of them orchids can be found. Although most people associate rupicolous orchids with the rock-growing laelias on the mountains, and indeed several of them grow like this, there are many many other types of orchids growing under these conditions. In fact, rocky habitats are by no means restricted to the mountains and thus this is a very interesting subject both by their type, range and orchid types as shown here with Encyclia alboxanthina. This is the digital version of my long-time Cattleya presentation. It is a tour throughout Brazil showing most of the habitats where Cattleya species can be found and the species of the genus that occur in them, as shown here with C. granulosa. As Cattleya species occur all over the country, this presentation shows most of the major regions and gives a good idea where cattleyas occur in Brazil. The most showy species are also shown with their color variations. The final result is of a guided tour throughout Cattleya habitats. In this second version of the Cattleya presentation, the main emphases is with the species and their grouping. Besides treating the species by affinity, there are several pages where different color forms are seen together to show species variation. Most importantly, however, is that there are screens where similar or related species are shown together, and this is very important to stress differences between those difficult to separate species (as with Cattleya nobilior and C. walkeriana, shown here). 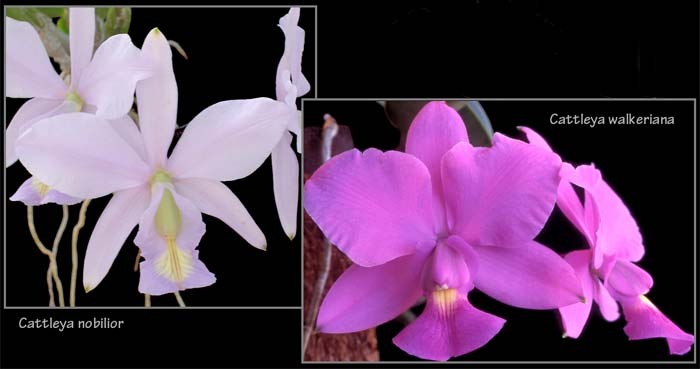 As with the Brazilian cattleyas, this is the digital version of my previous Laelia presentation. The Brazilian laelias are here shown and discussed (regardless of if people call them Laelia, Cattleya or Sophronitis). The different groups are all discussed and most species shown in their natural habitats as seen here for Laelia kleberi. For the more showy and/or variable species, the most outstanding and characteristic color forms are also shown. Also as with the cattleyas, this is a tour through the regions of the country where these plant are found, and as the result we see some of the most beautiful areas of Brazil. After lots of requests, we decided to put together a talk about just the rupicolous Laelia species. This talk is organized in a totally diferent way than my other presentations. Instead of a country tour, here the plants are grouped according to their affinity relations in terms of factors like general morphology and color among other things. The groups are then plotted in maps so their distribution can be discussed. Most of the known species are shown in pictures of their flowers and habitats, making this talk a very colorful and informative one. Most of the pictures are recent so the quality is about the best I could get. This is the last of my original slide presentations to be converted to digital. Here, Catasetum species are shown according to their distribution and in a sense we can consider it a country tour. Most of the species of the genus occur in the Amazon, and their pictures were taken during the four year period I lived there (1981 to 1985). The main habitats are mentioned and pictured, which help us understand where and why the plants live where they do. We discuss flower dimorphism, which is a very interesting feature of the genus, and female flowers are shown whenever available.